[MARTHA ASENCIO RHINE | TIMES] U.S. Rep. Gus Bilirakis accepted $6,810 in campaign contributions from three Tampa Bay pharmacy owners during the time period they allegedly ran a billion-dollar health care fraud. Bilirakis said he was unaware of the defendants' recent indictment and plans to donate the funds. Earlier this month, four Tampa Bay pharmacy owners were indicted in a billion-dollar telemedicine fraud that the Department of Justice says they ran since 2015, scamming patients and doctors across the country. 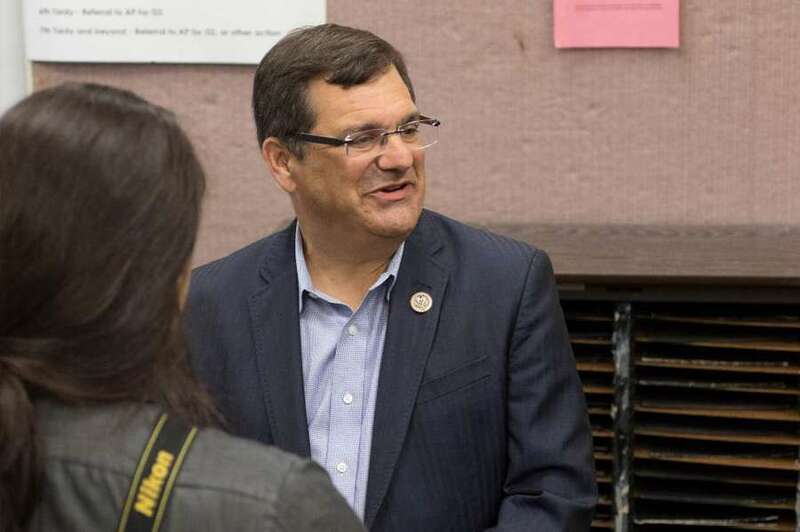 During the three years they allegedly operated the conspiracy, three of the four defendants gave a combined $6,810 in campaign contributions to U.S. Rep. Gus Bilirakis, R-Palm Harbor, according to Federal Election Commission filings. Beginning in June 2015, Andrew Assad of Palm Harbor, Peter Bolos of Lutz, Michael Palso of Odessa and Larry Everett Smith of Pinellas Park, and their pharmacies, solicited insurance and prescription information from tens of thousands of consumers nationwide and used the information to sell pain creams and other products at massively marked up prices, according to the indictment unsealed on Oct. 12. The scheme bilked $174 million from private health care companies, including Blue Cross Blue Shield, according to the Department of Justice. The four defendants, and Scott Roix of Seminole, who pleaded guilty in September to his role in the fraud, submitted at least $931 million in fraudulent claims. Assad gave a total of $4,450 to Bilirakis since 2015 while allegedly operating the fraud, including $1,950 this cycle as Bilirakis is running for a seventh term in the 12th Congressional District, according to federal filings. Palso gave $1,360 in 2017 for this election cycle and Bolos gave $1,000 in 2016. On Monday, campaign manager Towson Fraser said Bilirakis knows the defendants from the Coptic Orthodox Christian community. After being questioned about the indictment and contributions by the Tampa Bay Times, Fraser said Bilirakis would donate their contributions to the Pasco Alliance for Substance Abuse Prevention. "This is obviously a serious matter," Fraser said. "He was unaware of the indictment and is reviewing the situation." The pharmaceutical industry is one of Bilirakis' top sources of campaign contributions. He accepted $80,850 from the pharmaceutical and health products industry in the 2016 election cycle and $66,450 so far this cycle, according to the Center for Responsive Politics. Bilirakis was one of six co-sponsors a 2016 law that made it harder for the Drug Enforcement Administration to intercept suspicious shipments of narcotics to doctors and pharmacies during the opioid epidemic. Since the pharmaceutical industry began lobbying for the change in 2014, Bilirakis accepted $40,000 from the same drug companies Florida Attorney General Pam Bondi would later say "caused the opioid crisis." Democrat Chris Hunter, a former FBI agent and federal prosecutor, said Bilirakis' lack of accountability during the opioid epidemic motivated him to quit his job in December with the Department of Justice in Tampa to run for Congress. IN DEPTH: Will Chris Hunter be the Democrat to break the Bilirakis dynasty? "Gus' conduct is a direct consequence of being unaccountable throughout his entire career and should disqualify him in the minds of all voters, regardless of party, from further service in Congress," Hunter said. "Only when Gus is called out on his misconduct and he's caught does he do something about it." While a senior trial attorney with Department of Justice's health care fraud strike force, Hunter prosecuted cases of Medicare and TRICARE fraud involving compounding pharmacies, corrupt rehabilitation businesses, home health scams and other complex schemes that defrauded the health care system. He secured convictions of more than 30 defendants in schemes involving more than $160 million in stolen money. As a former fraud prosecutor, Hunter said the defendants' campaign contributions to Bilirakis should have been placed in an escrow account and given to their alleged victims as restitution. "You don't just get to appear magnanimous by making a charitable contribution with money your indicted donors stole," Hunter said. "The fraud scheme alleged in the indictment is coterminous with the time period of the donations he got. The way forfeiture works, no matter where the money is, it's proceeds of a fraud scheme. You don't get to keep it and use it for your own purposes." If convicted, Assad, Bolos, Palso and Smith face a term of up to 20 years in prison for each mail fraud charge, up to 10 years in prison for conspiracy and up to three years in prison for introducing misbranded drugs into interstate commerce, according to the Department of Justice.